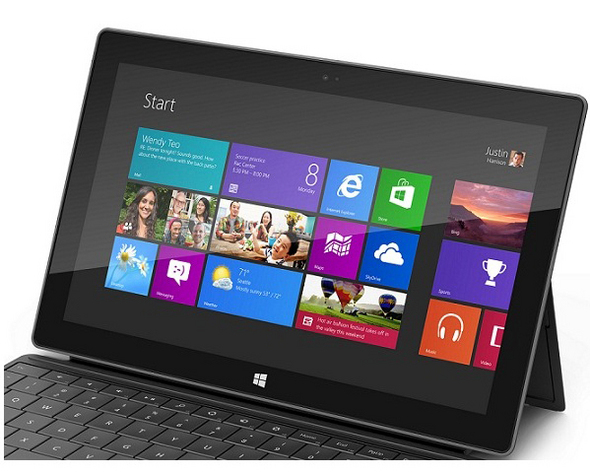 Microsoft Surface is the new tablet device made by Microsoft, running Windows RT and Windows 8. InformationWeek, today, released their top 10 for the coolest features of Microsoft Surface. I have listed them below with a little more information next to each. Surface: Where work meets play. The power of Windows, the productivity of Office Home & Student 2013 RT Preview, and the joy of Xbox – not to mention apps, social media, music, and more. Surface is also cloud-connected with SkyDrive, so you can access your content from anywhere, at any time. Microsoft believes a stand should be an integral part of a tablet's design. (Take that, iPad!) The Surface's built-in kickstand is made of the same sturdy VaporMg material--more on this later--that encases the slate. "The hinge design is like that of the finest luxury car," said Microsoft's Steven Sinofsky, sounding a bit like a car salesman. The stand does look ideal for landscape-mode viewing. But how well will it work in portrait mode? 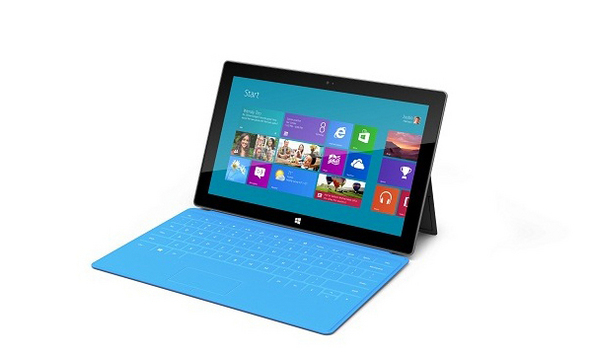 Surface: The integrated Kickstand enables hands-free entertainment. Kick back and enjoy HD video, take beautiful photos, or click in and do more with Touch Cover; Surface’s Kickstand gives you the foundation to do what you want. To use Surface as a tablet, just flip the Kickstand closed and it disappears into the casing. Surface is equipped with front- and rear-facing LifeCam cameras so you can capture all of life’s important moments in photos or video. The rear camera is angled upwards at 22 degrees, so when Surface is resting on the Kickstand, the camera looks straight ahead. Just lean Surface back and start filming, hands-free. Capture life’s greatest hits, and share the action with social media and email apps. Surface sets the stage for hands-free fun. 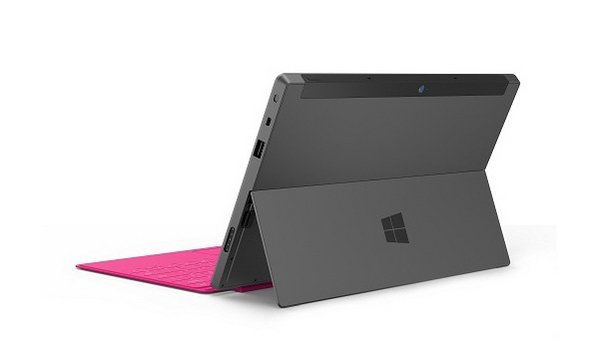 Flip out the Kickstand and use Surface as a personal entertainment center. Watch movies with Xbox. Get cooking in the kitchen with Surface as your assistant – follow cooking videos, food blogs, and online recipes in brilliant color while your hands are free to measure and mix. You've gotta be thin to compete with the iPad. The Surface for Windows RT is 9.3 millimeters thick--or "thin," as the marketing folks are fond of saying. That's 0.1 millimeters thinner than the new iPad, not that you'll notice the difference. The Surface's edges are beveled back at 22 degrees, making the slate appear even slimmer than its specs might suggest. Surface is the first PC with a full magnesium case, making it light yet rigid, Redmond says. The Surface's coolest feature isn't its 10.6-inch display or ultra-thin design, but rather the clever Touch Cover that's both a screen protector and a multi-touch keyboard. Just 3 millimeters thick--the Surface with Touch Cover attached measures a still-svelte 12 millimeters--the cover has a magnetic connector that secures it to the tablet. 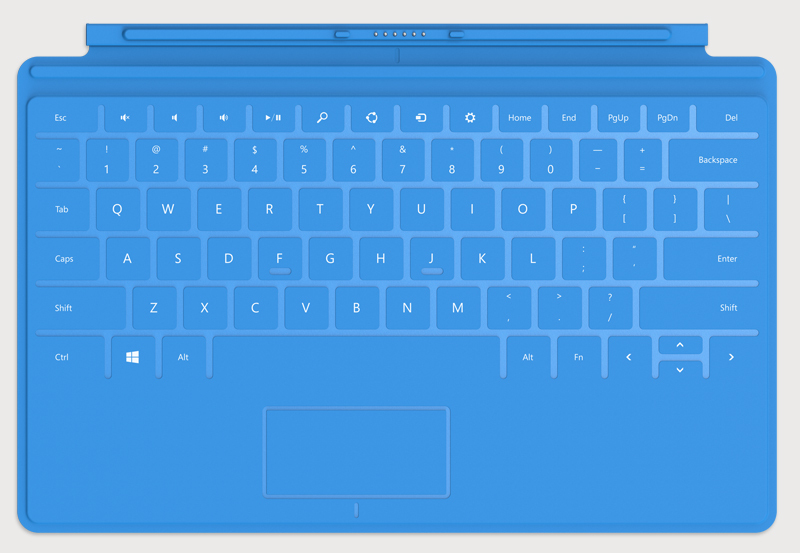 The keyboard doubles as a track pad with left and right buttons, and has special keys for Windows 8's Metro interface. "On average, typing is twice as efficient as typing on glass," said Sinofsky. True? We'll have to wait a bit longer to find out. Microsoft didn't let reporters bang on the keyboard at the June 18th event. Surface: A cover you can type on. Touch Cover clicks in to Surface and offers a slim, spill-resistant keyboard for typing. Available in vibrant colors, you’re sure to find a cover to match your personal style. Or choose Type Cover, which combines the speed and comfort of a classic keyboard with a super-thin, lightweight design that’s ideal for extended usage at home or at the office. Some work calls for the convenience of a keyboard. Touch Cover is a pressure-sensitive keyboard and cover, measuring just 3mm and weighing less than half a pound. Featuring Windows shortcut keys, media controls, and a trackpad, Touch Cover makes work fast and fun. Need to be even more productive? Try Type Cover, the dual cover and mechanical keyboard that offers a classic typing experience. When you need to get moving, flip Touch Cover or Type Cover over your Surface display. Both covers automatically turn off the display, preserving battery life while helping to protect your Surface when you’re on the go. Keystrokes are disabled when your cover is closed or folded back. Touch: Designed for Surface, Touch Cover is a revolutionary dual-purpose pressure-sensitive keyboard and protective cover. The bright, smooth surface lets you type up to 2x faster than onscreen. Email, chat, work, and connect with friends in style. Built-in trackpad and Windows shortcut keys give you quick, easy ways to navigate Surface. Touch Cover is spill-resistant, easy to clean, and comes in five vibrant colors (Black, White, Cyan, Magenta, and Red), so you can express your personal style. Type: One of the thinnest mechanical keyboards available, Type Cover features a QWERTY keyboard, a full row of Function keys (F1-F12), Windows shortcut keys, media controls, and a trackpad, giving you maximum agility for navigating your Surface. The comfort and speed of a traditional keyboard, with a revolutionary design that combines the best of productivity and protection. The Surface's keyboard has a few more tricks up its sleeve. You can rest your hands on top of the keys, something you generally can't do with an onscreen keyboard. Microsoft invented a fast, pressure-sensitive digitizer that enables this feature; an algorithm helps determine whether you meant to press a key or not. Microsoft calls this feature "tap detection." One unanswered question: Will Touch Cover come with the basic Surface package or cost extra? But wait, there's more: A second keyboard for fast touch-typists, or users who prefer the feel of tactile keys, will be available too. Called "Type Cover," it offers 1-millimeter key travel in an extremely thin package. The iPad and other tablets are targeted primarily at consumers, but Microsoft is casting a wider net. While the Windows RT-based consumer model uses an ARM processor, the powerful Surface for Windows 8 Professional is designed for power users and enterprises. Featuring a 3rd-generation Intel Core i5 CPU, the Pro model runs Windows desktop apps, has full HD (1080p) graphics, supports digital ink for pen input, and even has a nifty magnetic-charging connector for a stylus. Microsoft is very proud of its VaporMg manufacturing process that enables the Surface's sturdy shell, smooth finish, sleek design, and intricate angles. The complex procedure begins with an ingot of magnesium, which is melted down to a molten state and molded to 0.65 millimeters thick; by comparison, a credit card is 0.75 inches thick. The resulting VaporMg case is thin yet strong. "They've stacked every component so tightly in the product that if you stuck a piece of tape in the middle of the device, it would bulge out," said Panos Panay, leader of the Microsoft team that created Surface. 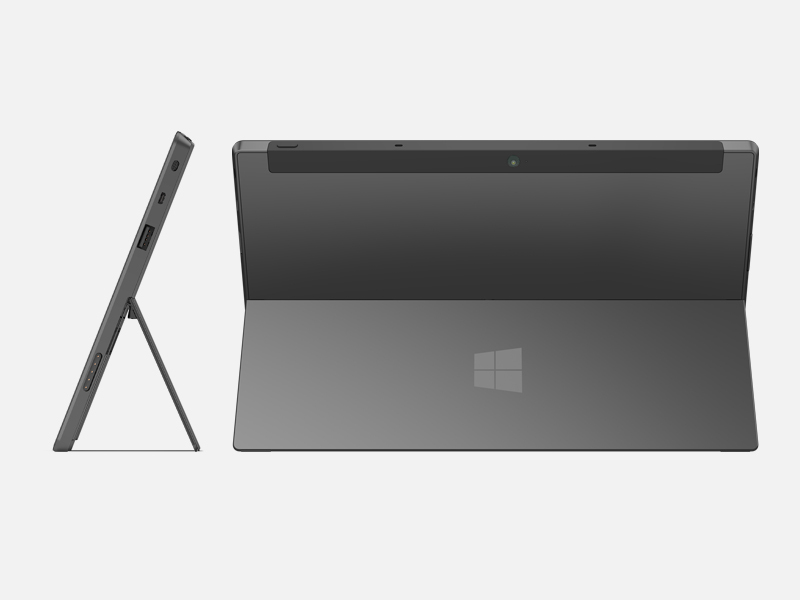 Surface: A feat of engineering and a work of art. One touch and you’ll recognize the thoughtful design and precision craftsmanship that make Surface a joy to behold. The unique VaporMg casing delivers a high-quality fit and finish that’s ultra-light and durable. Great design is about understanding how less can be more. With device walls that measure just 0.65mm, the interior of Surface is as compact as possible. Crafted from a molten magnesium alloy, VaporMg is three times lighter than aluminum, with a highly durable exterior. Anti-fingerprint coating helps keeps Surface looking flawless. The Surface may be ultra-thin, but it's thick enough for a full-sized USB port. Surface for Windows RT supports USB 2.0, while Surface for Windows 8 Pro supports the speedier USB 3.0 spec. The benefit here, of course, is that you won't have to cough up more cash for an overpriced proprietary cable to connect your USB-based peripherals. Are you listening, Apple? Surface: Surface with Windows RT is incredibly thin, but still features a full-size USB port, microSD card slot, and HD video out port. Easily transfer files or use compatible accessories. Charge up, plug in, and show off. Need to quickly transfer large files? Plug in a hard drive or thumb drive and drag and drop files like you’ve always done with Windows. Surface makes it easy to keep all your content organized – from photos and documents to videos, music, and movies. Charge your phone with the full-size USB port. Connect accessories like mice or printers certified for Windows RT. Take your media collection with you anywhere. Located just under the integrated Kickstand, the microSD card slot gives you up to 64GB of extra storage. Load up with music, movies, and pictures and take them with you anywhere. Want to share your passions or work with more people? Show off everything on an HD display using the HD video out port. Surface has two cameras--front and back--which is de rigueur for an iPad competitor. Microsoft hasn't release the cameras' specs yet, but has said the rear-facing "LifeCam" is angled to 22 degrees, allowing you to open the kickstand and conduct meetings hands-free. Surface's stereo speakers and dual microphones are "tuned for Skype," following Microsoft's high-profile purchase of the company last year. Given Skype's global popularity, a superior video-chat experience could help Surface gain a foothold in both the consumer and enterprise markets. The Surface for Windows 8 Pro, powered by a speedy Intel Core i5 CPU, can run demanding Windows desktop apps that generate a lot of heat. So how does Surface stay cool? 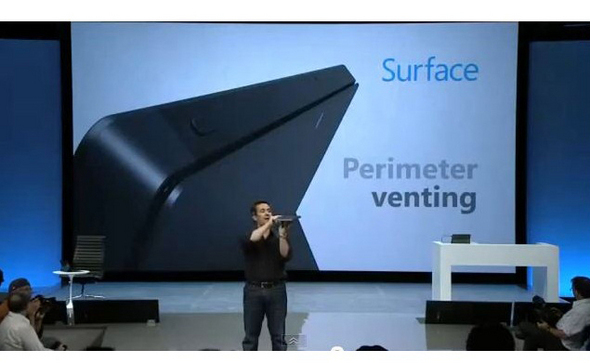 Microsoft's solution is "perimeter venting," a groove that extends around the outside of the case. The design allows air to be uniformly distributed across the entire tablet. Your hands won't block the airflow, either. The 10.6-inch ClearType HD Display has a 16:9 aspect ratio and a wide viewing angle. Its optically-bonded design benefits stylus users by eliminating layers between the cover glass and the screen. "It feels like you're inking right on the page," said Angiulo. "The distance between the stylus and where I see the ink is only 0.7 millimeters. That's the thinnest and closest distance of any tablet PC--any inking tablet--ever." Good digital-ink capabilities will help Surface Pro's chances in the enterprise. The screen’s 16:9 aspect ratio is ideal for watching HD movies and playing games. The extra-wide viewing angle lets you share content with people around you. We use an optical bonding technique to reduce the spaces between the panes of glass that comprise our display. This helps minimize light refraction, so crystal-clear pictures can shine through. Windows 8 Tablets: Will The Price Be Right?